HERE WE HAVE 24 X ANTIQUE GEORGIAN/VICTORIAN KEYS SOLD AS JOB LOT, LARGEST SIZE 70,MM LONG, SMALLEST SIZE 47. Wrought Iron Door Lock / Latch. 1.75" knob width. 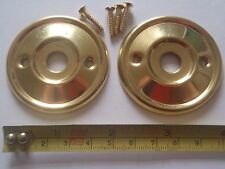 2 x 52mm DIAMETER ANTIQUE STYLE BRASS DOOR KNOB BACK PLATE / ROSES RIM LOCK ETC. TRADITIONAL SLOT HEAD BRASS FIXING SCREWS ARE INCLUDED. This lock dates from around the 1920's era and is in nicely REFURBISHED condition with its gleaming polished brass work which looks superb. This is a very nice old cabinet lock which is in very good, nicely REFURBISHED condition with its lovely polished brass work and it is in good working order supplied with one working key which works the lock very well with a nice solid feel. X 2 ORIGINAL GEORGIAN OR VICTORIAN DOOR KEYS. IN GOOD ORDER BUT NEED A CLEAN UP. Get images that. ANTIQUE 17th CENTURY BRASS DOOR /LOCK/FINGERPLATE. SHOWS SIGNS OF AGE RELATED WEAR. 19 x 7 inches. Antique Gibbons,Ward Keys Asylum,Prison,jail,Lock Vintage,GM.Master Key,Gift. Lunatic asylum prison ward hospital workhouse keys. great ward keys to add to your collection.would also make a fabulous present for a key collector. They Are Given as a Gift . Large Antique Reclaimed Victorian Steel Door Rim Lock Key Keep 9" x 6 1/2"
A large reclaimed and unrestored antique 19th century rim lock with original keep and key, in full working order but would benefit from cosmetic restoration and a service. 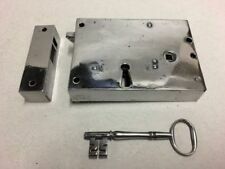 The lock box is made from steel with a 6 screw fitting (4 front & 2 flange), and has a brass handle which operates the sprung latch bolt, it's original large key with ornate bit for the dead bolt, and it's original steel keep with brass striking plate (6 screw fitting). The bolt throws to the left - please see all photos and click to enlarge. Large Victorian Iron Sliding Door Bolt Window Lock Gate Georgian Antique Old 12"
WE HAVE OTHER BACK PLATES THIS SIZE WITHOUT THE DRILLED FIXING HOLES AND SCREWS. VARIOUS DECORATIVE USES INCLUDING FURNITURE RESTORATION / DOOR KNOBS / RIM LOCKS ETC. Old Vintage 1930's antique 1 LEVER BRASS BOX LOCK OR CHEST LOCK 1 working key. This is a special3-way lock which can be used as a box/chest lock or it can be used as a right hand or left handsliding cabinet door lock. This is a very nice well made old 1 lever box lock which is in good condition for its age with its gleaming polished brass work and it is in good working order with one working key. Antique Gibbons,Ward Key Asylum,Prison,jail,Locks,Master,key Old .3095..J 2 . Lunatic asylum prison ward hospital workhouse keys. J.2 Early Gibbons ward key. Fab ward keys to add to your collection.would also make a fabulous present for a key collector. I can clean them a bit more should you wish. Lunatic asylum prison ward hospital workhouse keys. Totally Uncleaned. Great ward keys to add to your collection.would also make a fabulous present for a key collector. (4)This beautiful heavy 6.5CM Georgian/ Victorian key. Exceptional condition, considering it's age. The key has had a busy life. It now needs to be looked after. Seriously this key will look good in any collect, a must to have. Here I have for sale a very nicely refurbished heavy gauge STEEL AND BRASS CONSTRUCTION original Georgian/Victorian horizontal RIGHT HANDED Mortice Lock and 1 matching working key which works the lock very well with a nice solid feel. This lock set is in good working condition. The solid brass handle is a quality copy of a Victorian type. Each of the brass knobs screw on to the spindle ends and are secured with grub screws. The cast brass back plate fits over one of the knob ends. 5 X ORIGINAL GEORGIAN LARGE CAST IRON CHURCH / DOOR, ALL NICE CONDITION WITH ORNATE LEVERS. Georgian Wrought Iron Door Lock Latch Victorian Antique Knobs Handles Old . Dimensions 4"x4" Dispatched with Royal Mail 2nd Class. Wrought Iron Door Lock / Latch. Georgian Wrought Iron Door Lock / Latch. Victorian Architectural Antique. 1.75" knob width. Georgian / Victorian Safe / Strongbox Key ,4 3/4" long including Dust Excluder. Excellent Condition with Fine radiused Warding. Here is a beautiful genuine Georgian brass rim lock, keep , key, with spindle , escutcheon/key hole cover and fixing screws. I have sympathetically made the keep to match the lock. The lock has a thumb latch as well as a double locking system when the key is turned once and then again. I have included the escutcheon for the other side of the door. Please see photos for dimensions and a view of the back of the lock. Backset sizes from front of lock to Centre's. Fully working condition but no key. They are in good condition with obvious wear from age. The size is 13.5 cm and 12 cm. Cabinet,furniture Lock, ward,desk box. on a ball chain Fab Keys. 100s of super fab Keys still left. and a gift bead. All are cleaned by hand. 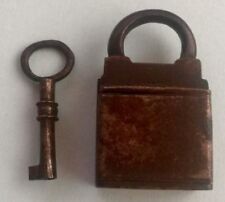 THREE LARGE GEORGIAN PADLOCK KEYS. Georgian Wrought Iron Door Lock / Latch. Victorian Architectural Antique. Georgian Wrought Iron Door Lock / Latch. Sold as a project, its seized. Victorian Architectural Antique. 1.75" knob width. Beautiful antique Georgian door lock. On the other side the brass escutcheon is an attractive shape. There is no key. A stunning antique door lock. More expensive, but safer for both parties. A genuine old large, heavy,iron, door lock key. 5" long in excellent condition with age appropriate marks and use wear. The size is 16 cm and 13 cm. New high quality Georgian style steel bow key blanks. Key: K308 size. Antique Georgian wrought iron door latch. Overall width 174mm (including latch). Door to centre handle 70mm. 6 hole fixing. All estimates are for the United Kingdom. We try to recycle where ever possible. Here I have a amazing antique Love heart skeleton key. this key is beautiful thing and its in great condition. Brilliant for display, wall art, a prop, a gift I think they would make an amazing quirky gift between to partners. Antique Georgian wrought iron door latch. Overall width 122mm (including latch). Door to centre handle 78mm. 4 hole fixing. All estimates are for the United Kingdom. We try to recycle where ever possible. It is strong and robust and remains a functional piece. This is an original 18th Century door lock of large proportions. It has one key which opens and closes the lock freely and smoothly. The main boxed unit is steel will a iron locking plate. THREE ANTIQUE 18TH/19TH CENTURY GEORGIAN KEYS. Genuine Old Keys x2 on a ball chain. Great keys to add to your collection. 3/4 cleaned by hand inc a ultrasonic bath. or a gift to a key collector. ANTIQUE DOOR LOCK & KEY.